In April, the Indian Air Force carried out the largest war games in the last three decades by bringing together more than 1,100 aircraft. The exercise, named Gagan Shakti, was used to test the IAF’s combat readiness for a short and intense war. It boosted the confidence of the Air Force, especially with regard to fighting a two-front war. At the biannual meeting of top IAF commanders held on May 31, Defence Minister Nirmala Sitharaman praised the force for carrying out such a major exercise without any glitches. She said the focus of the exercise was to draw lessons for evolving the doctrinal loop of the IAF. If all the inductions take place as planned, the IAF is expected to achieve its authorised strength of fighter squadrons by the end of the 15th Plan (2032). The man who was in charge of the exercise was Air Chief Marshal B.S. Dhanoa. In an exclusive interview with THE WEEK, he said the exercise demonstrated the IAF’s capability to achieve and sustain a very high serviceability of aircraft and systems. 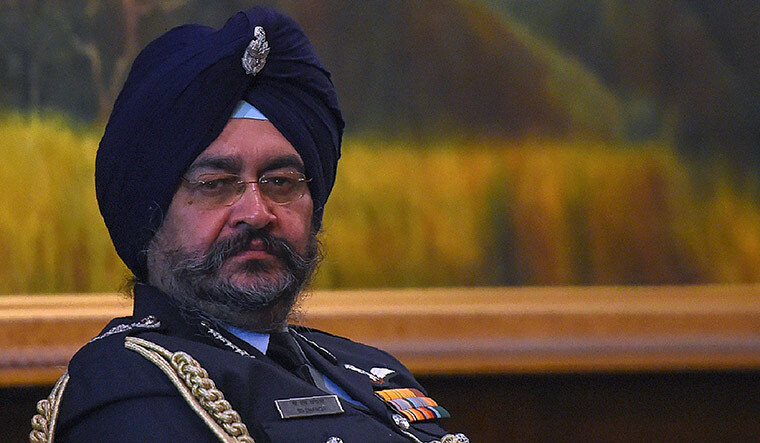 Dhanoa, however, expressed concern about the depleting combat strength of the IAF, and said the force would reach its desired strength only by 2032. At present, the IAF has 31 fighter squadrons, but it needs at least 42 to fight a two-front war. In comparison, Pakistan has 25 combat squadrons, while China has 60. Dhanoa defended the Rafale deal by saying that there was “no overpricing” and that the government negotiated a very good deal. He said the delivery of the Rafale jets was progressing as planned and they were expected to be inducted into the IAF between 2019 and 2022. How was the IAF’s experience with Gagan Shakti? It was one of the largest exercises conducted by the IAF, considering the scale of asset utilisation and manpower participation. The IAF has achieved more than its laid-down objectives for the exercise. The aim was to test our real time coordination, deployment and employment of air power in a short and intense battle scenario. The logistic stamina, operational logistics, supply chain management, op readiness and prolonged sustenance of high tempo operations were put to test. What are the lessons learnt from the exercise? The IAF demonstrated its capability to achieve and sustain a very high serviceability of aircraft and systems. During the exercise, the IAF carried out missions across all spectrums of flying operations. We carried out the exercise in close coordination with the Army and the Navy. The capability to conduct special operations by transport and helicopter fleets like large-scale para drop, inter-valley troop transfer, and the utilisation of advanced landing grounds were practiced towards the delivery of combat power, in the shortest possible time. The IAF also demonstrated the enhanced reach of combat platforms in the maritime domain, while operating from bases in southern India. We have learnt valuable lessons in these spheres and there have been many takeaways from this exercise that will be incorporated on priority. Has the report of the umpires nominated to judge the exercise been finalised? Critical analysis of the exercise is underway to highlight the areas of concern and to suggest measures to improve our combat potential. The improvement of operational efficiency is an ongoing process. This exercise has brought out many important aspects of operations, which would help hone the combat potential of the IAF further. How do you react to the dwindling combat squadrons of the IAF? The IAF is the guardian of the Indian skies. We are ready 24x7 to respond to any hostile situation, with our available resources. As far as the drawdown in the strength of the fighter squadrons is concerned, it is being given due emphasis. We are upgrading MiG-29, Jaguar and Mirage-2000 aircraft in a phased manner, as part of obsolescence management. The induction of 36 Rafale aircraft will commence by September 2019, and will significantly enhance our operational capability. The induction of the remaining Su-30 MKI aircraft [of the total 272] from Hindustan Aeronautics Limited will be completed by 2020. The induction of the 40 indigenous light combat aircraft (LCA) Tejas is also ongoing. Additionally, the RFP (Request for Proposal) for the procurement of 83 LCA Mk1A was issued last December. When is the IAF expected to achieve its required combat strength? The next step would be the design and development of the LCA Mk2 which has been renamed as medium weight fighter (MWF). Further, RFI (Request for Information) for 110 new fighters has been issued on April 6, 2018. If all the inductions take place as planned, the IAF is expected to achieve its authorised strength of fighter squadrons by the end of the 15th Plan (2032). Do you expect timely delivery of the Rafale jets? All activities related to the induction of the 36 Rafale aircraft are progressing as planned. The delivery will commence in September 2019, and will be complete by April 2022. Is the IAF prepared for a two-front war? The IAF is capable of meeting every challenge that our country is likely to face.